Much has been written about the strong growth rate of sub-Saharan Africa's large corporates. Less has been written about its small businesses. Africa's corporate giants such as Kenya's mobile money platform M-Pesa have been a darling topic for many an African economist. However the reality on the ground is that an overwhelming majority of the population live in the subsistence farming, micro-business, and small business ecosystem. First of all, however, let's define what we mean when we say "small businesses". The U.S. Small Business Administration Office of Advocacy defines a small business as an independent business having fewer than 500 employees. However, in the African context, the phrase tends to have an entirely different connotation. Think of an informal, obviously unincorporated, roadside kiosk run by a man and his wife, hence the popular moniker “mommy and daddy” business, or “mom and pop shop” for short. Or perhaps even smaller - a “one man, one van” operation that transports vegetables from point A to point B from time to time. According to K.V Gough’s research conducted in South Africa and Ghana, it is now increasingly accepted that the informal business sector is extremely important in developing countries. Millions of Africans have taken it upon themselves to impact their own societies by growing micro businesses that gradually but ultimately create jobs for others. However, these informal businesses tend to be overlooked by national statistics, which most often do not have the capability to capture their significant relevance. Now this brings us to the question at hand. Can this significant segment of sub-Saharan Africa’s business sector grow out of the “mom and pop shop” category? Many of sub-Saharan Africa’s home-based business owners choose to remain small. It’s more manageable, causes less stress and, most importantly, carries less risk and requires less capital. However, with a booming, young population, sub-Saharan Africa needs more home-based businesses to grow, create jobs, and contribute more towards developing our economies. K.V Gough’s study in 2016, carried out in Ghana, showed that 83% of Ghanaians worked in the informal sector, a sector that produces only 22% of its GDP. 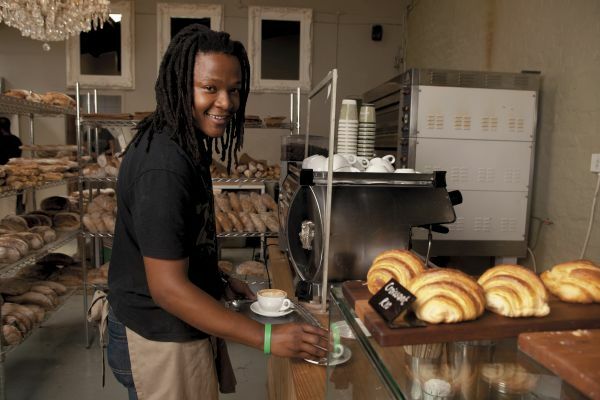 Meanwhile, a report by Quantec Research (2016) revealed that 36% of South Africa’s GDP comes from small businesses, compared to the government’s contribution of 11.7%. In addition to that, just 57 member companies registered under Business Leadership South Africa (BLSA) log 35.9% of South Africa’s total collected taxes and create jobs for over 3.26 million people. Furthermore, these 57 member companies in the study contribute 23.5% of total private sector employment, and pay full-time and part-time employees just under 2 trillion rand (US$163 billion) a year. Imagine the impact the business sector would have if small scale businesses were to follow suit and operate on a larger scale. ORIGINALITY: They appealed to the local niche through uniquely “African” or “fusion” ingredients, recipes, and decorations. SUPPLY CHAIN COMPETITIVE ADVANTAGE: They invested in modern equipment and ingredients to shorten supply chain processes while lengthening product shelf life. INDUSTRIAL PARTNERSHIPS: They realized the importance of partnering rather than competing with rivals. In fact, some of the largest companies in the region today started as “mom and pop shops”. Mukwano Group, a massive Ugandan conglomerate that now employs over 6,000 workers in Uganda, Kenya, Tanzania, Rwanda, Burundi, and the Democratic Republic of Congo across a group of companies that include fast moving consumer goods, logistics, agriculture, and banking, started initially as a family-run business that made and sold soap bars. They now rake in an annual revenue of US$230 million (2012 estimate). Small businesses in southeast Africa do have a real shot at, not only substantial growth, but also providing the economic fuel the region needs to pull millions out of poverty through employment. From a macro-economic perspective, Africa’s throbbing population of over 1.2 million provides a US$ 600 billion per annum consumer market that lacks many goods and services that small businesses can now supply reasonably easily through modern international logistics. From a micro-economic standpoint, the skyrocketing supply of young, literate, skilled, technology-savvy members in the workforce is driving up the demand for modern, corporate employment. Meanwhile, the ever-growing supply of incoming foreign goods and the avenues with which to access them is driving up the demand for an expanding array of modern products that small businesses can broker in addition to their traditional role of being a purveyor of foods and basic household goods. The scene is set. All it is waiting for is the right players, players who know how to connect the dots. "Ask ABI" QUESTION 3: How Far Along Is Africa In Its “Off-Grid” Potential?